This is my second month posting in a new group called #TheSaladBar. This month our theme was avocado. Now I love a good avocado but I usually use them in either guacamole or tacos but I have used them in salads before. 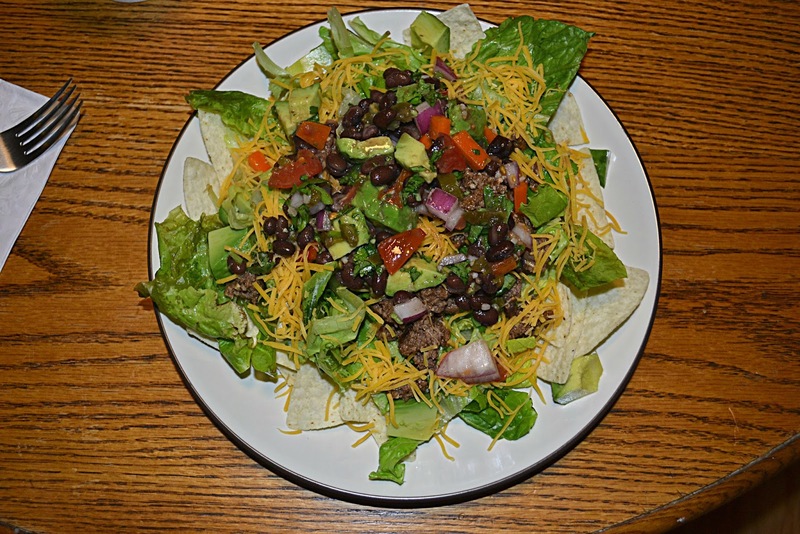 Of course thinking about avocado in salads made me think taco salad. 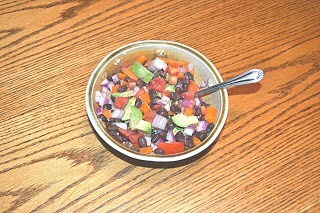 I found a yummy sounding salad with black bean avocado salsa on top. However, it used 5 pounds of beef and cooked it in a crock-pot all day. I used the same sauce and spices but I used ground beef and made it in the skillet. Much easier and quicker. 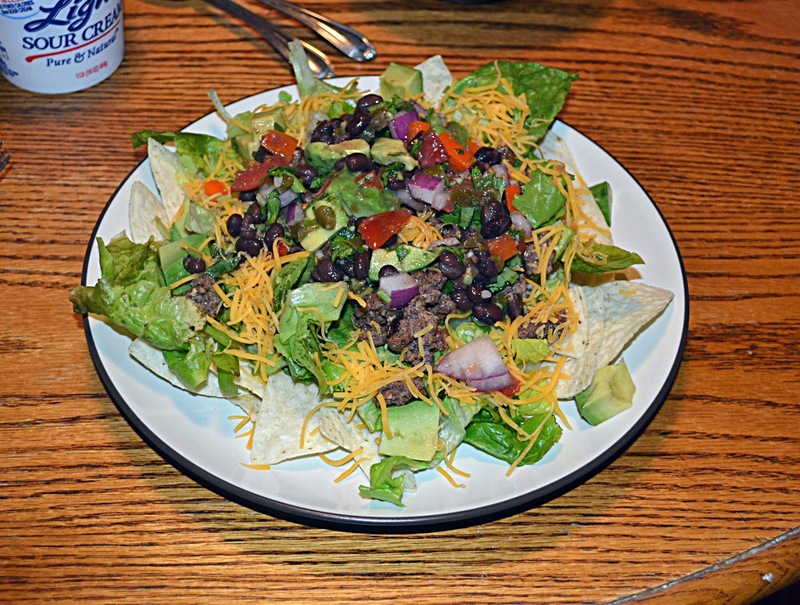 The best part of this salad is the homemade salsa. It is so bright, fresh looking, and colorful. 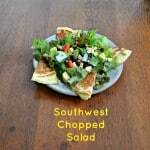 It’s perfect for all the fresh summer vegetables and it really made the salad look delicious. 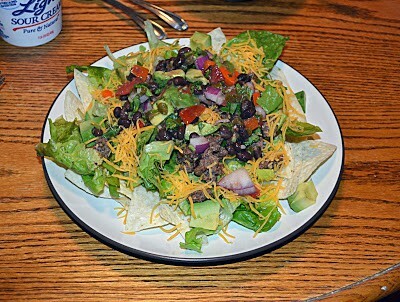 This was a great dinner salad that was filling, didn’t heat up my house while I was cooking, and it looked good too. 1. In a medium bowl combine the vinegar, garlic cloves, cumin, oregano, pepper, salt, lime juice, chipotle pepper, and chicken broth. Mix well and set aside. 2. Place the ground beef in a skillet and heat it over medium heat until it is browned and heated through. Pour the sauce over top and bring to a boil. Lower the heat and simmer for 10 minutes. 3. Meanwhile, combine all ingredients for the salsa. 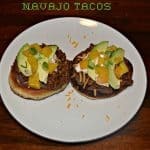 Toss to combine and refrigerate until ready to serve. 4. 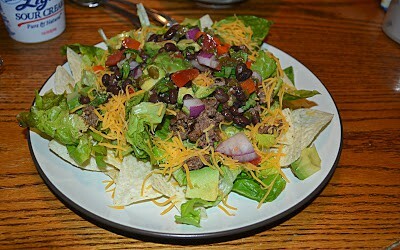 To serve place tortilla chips on four plates and divide the lettuce between the plates. 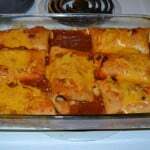 Top with one quarter of the beef mixture and sprinkle with cheese. Pour several heaping spoonfuls of black bean avocado salsa on top. 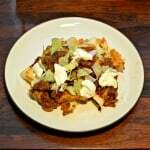 Dollop sour cream if desired. This is a beautiful salad. Food always tastes better when it looks colorful. Mmmm…I love your taco salad! Hearty enough that the hubby would eat it, too! This sounds wonderful! The barbacoa beef sounds delicious.